Get A Special Savings Discount For Grand Circle Travel or Overseas Adventure Travel. We have posted this special webpage with a discount code that saves you $100 off the lowest possible rate when booking a tour or cruise on Overseas Adventure Travel or Grand Circle Travel. My name is Jesse Slome and I am executive director of the American Association for Long-Term Care Insurance. That's my work passion. My personal passion is exploring the world. That's why I have created this special page. 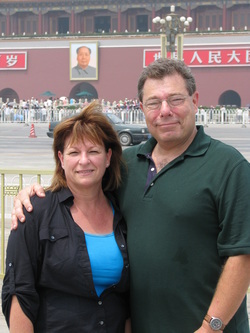 Because for the past few years, my wife and I have taken and enjoyed several tours with Overseas Adventure Travel (OAT) and Grand Circle Travel. Both companies offer a special discount to first-time travelers when they say they were referred by another traveler and provide their code. The savings is $100 per-person and comes off the lowest rate. Here's all you have to do. When booking your trip with either Overseas Adventure Travel or Grand Circle, simply provide my Customer Number 000932019 and name (Jesse Slome). You will receive the $100 savings. And, yes, we do also get a credit toward a future trip. The savings you get and the credit we get DO NOT impact your cost. That's why you have nothing to lose ... and everything to gain by requesting it. SPECIAL BONUS: OAT just offered an additional 10% savings (PLUS the $100) when you book any departure between January - March 2014 with Overseas Adventure Travel. I have posted the code below ... but this ends August 1, 2013. Then just the regular $100 savings remains. Added 10% Savings Overseas Adventure Travel for tours between January - March 2014.